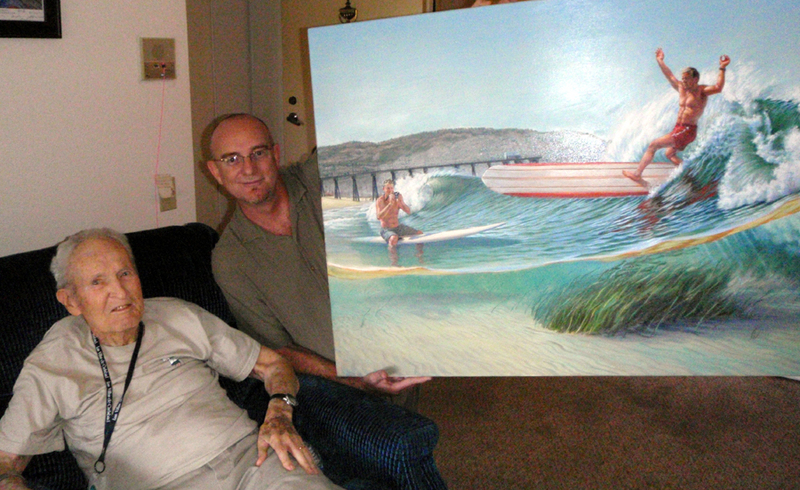 Thursday February 3rd 2011 the surf photography legend LeRoy Grannis passed away at the age of 93 1/2 at his home in Torrence, CA. LeRoy’s water photography of surfing in the 60’s & 70’s made legends out of surfers. A surfer’s talent and identity wouldn’t be if it weren’t for surf photographers capturing those fleeting amazing moments on the wave. 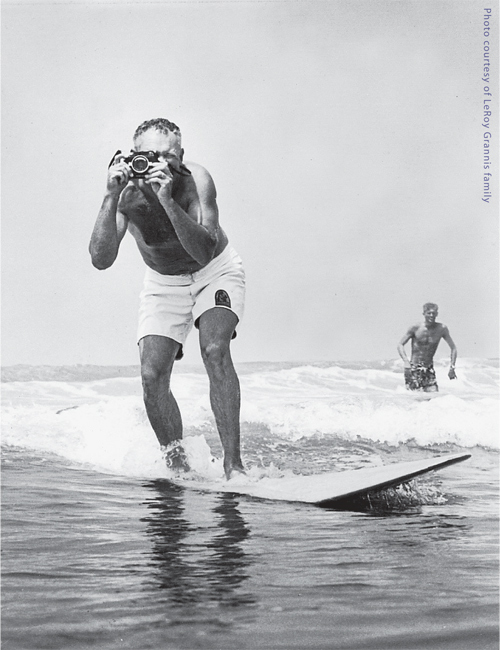 A surf legend’s existence is co-dependant on the talent of the photographers (as well as for many surf artists). LeRoy was a pioneer in this field. And many surf legends owe their careers to LeRoy for being at the right place at the right time with the right equipment. I received a call this morning from John Grannis, LeRoy’s son, informing me that his dad wasn’t doing so well and was in a coma. LeRoy, now 93 1/2 yrs old, is not expected to be with us for much longer. John and I had been talking in the last week about the Hermosa Beach sculpture project, its progress and about having his family down to participate in the sculpting with me. John was so gracious as to let me talk to LeRoy via speaker phone. Choking up and pulling myself together (not being prepared to have this final moment right then) I took the opportunity to tell LeRoy about how cool the sculpture is going to be, & how his son & granddaughters are going to help me out with sculpting. 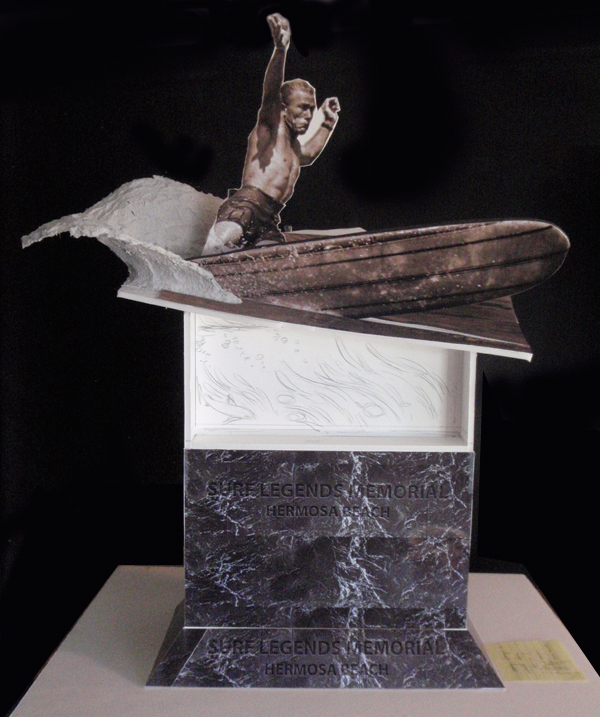 Then I thanked him – I thanked him for his photography, the images he captured, for documenting surfing history and being an inspiration for this piece and all the other artwork created from his photographs. “God Bless you LeRoy” I said. “And I wish you a peaceful sleep”. LeRoy is and forever will be an important part of my life and career, just for that one photo image of Dewey Weber that I will build a bronze sculpture from. I cherish the wonderful opportunity to say “Thanks” and “Goodbye” (for now). And I greatly appreciate John being so gracious and thoughtful to give me that phone call and that moment with his dad. It means the world to me and I am at peace with his passing. Thank you John and most of all Thank you and God Bless you LeRoy. On my bicycle ride home crossing over to Balboa Island on the ferry I was suddenly overtaken by a sense of joy and happiness when the though occurred to me that LeRoy will finally be reunited with his wife. The image of his wife Katie waiting for him with love and open arms just made me happy for LeRoy, and I felt a sense of relief for him. Strange that I would be sensitive to have that notion. I am grateful to have met and known LeRoy for a short time. I am honored to be immortalizing his art. Sad that he’s gone, but happy he is in a good place now.